3D printing—or “additive manufacturing,” as it’s called when you get industrial like this—is seen by NASA as a vital way to keep rocket component development costs down. In a lot of ways, the ability to rapidly prototype via DMLS harkens back to the Apollo-era development method of fast physical iteration. 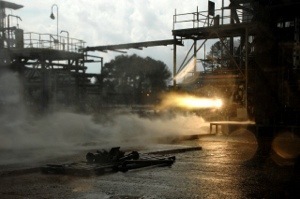 Rather than spending a tremendous amount of time performing deep, computer-based analyses of rocket components, NASA can rough in a design and then print and test a component within hours or days. The deep analysis and simulation tools are still available and still used, but the months- or years-long physical manufacturing time is drastically reduced. This gives engineers the flexibility to design and build in the most optimal fashion. They can use complex software analysis where necessary, but they don’t have to rely solely on computer modeling. In the days of Apollo, NASA operated with effectively unlimited funding, which it used to create a nation-wide army of contractors with tremendous manufacturing capabilities. Design-by-iteration was feasible because there was so much design going on. These days, the picture is entirely different. “It’s almost a cultural issue,” explained Williams, “where a part can cost so much, you get into what I call ‘analysis paralysis. '” Without additive manufacturing, prototype rocket parts that can withstand actual hot-firing can cost so much and take so long to produce that when you finally get a physical component to test, you’re already hoping the tests show that it’s perfect—otherwise it would take too long to redesign. With additive manufacturing, that paralysis goes away, and engineers can iterate as needed on actual physical components. Ingenuity unleashed, development accelerated, designs simplified…the power of 3D printing. This entry was posted in 3D Printing, engineering, Technology and tagged injector, MLS, Rocket by Sci Fi Engineer. Bookmark the permalink.